True to the rumors, Apple Watch comes with a special Power Reserve mode that will lightly sip on juice so your watch can keep ticking. Tim Cook didn’t specify how long Apple Watch’s ‘all day’ battery lasts, but Apple’s website specifies you could potentially keep your watch alive for an extra 72 hours in Power Reserve mode. You should be able to get 18 hours of battery from your Apple Watch. According to Apple’s tests, that includes 90 time checks, 90 notifications, 45 minutes of app use, a 30-minute work with music playback from Apple Watch via Bluetooth. Talk Time clocks in around 3 hours with the battery, while audio playback lasts for 6.5 hours. If you just want to use it during workouts it should last for 7 hours straight. 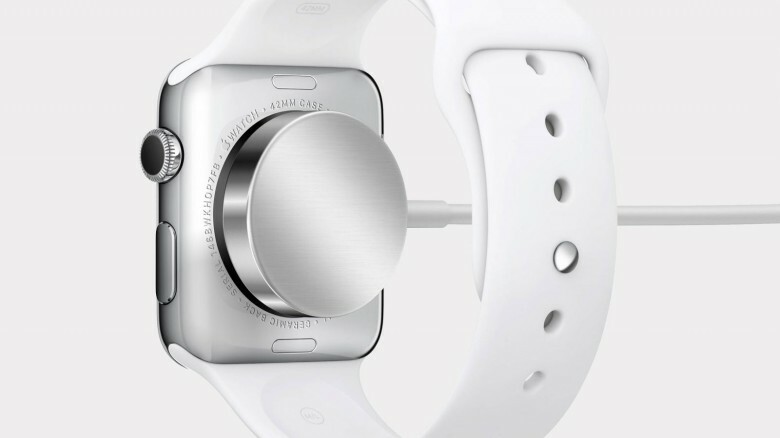 Charging your Apple Watch from zero – 100% will take 2.5 hours based on Apple’s tests, or 1.5 hours to reach 80%.